The very pregnant 31-year-old Cecilia Liu Shishi (劉詩詩) has left Beijing for Taiwan recently, where she will be giving birth to her first child with 48-year-old Taiwanese actor Nicky Wu (吳奇隆). 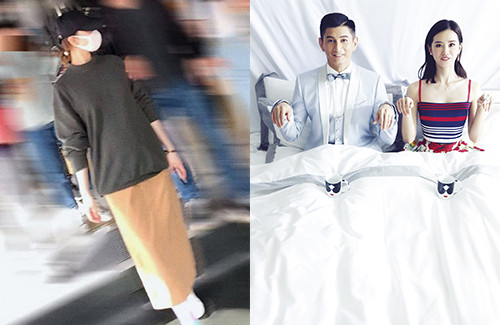 Currently seven months pregnant, a netizen spotted the couple shopping in Taipei. Wearing caps and face masks, the couple tried to maintain low profiles. Cecilia was sipping a cold drink as she looked around a shoe store. The couple, who started dating after collaborating in 2011’s Scarlet Heart <步步驚心>, announced their marriage in January 2015. Their wedding was held in Bali in March 2016. Though the couple never officially announced their pregnancy, close family and friends have confirmed the news for them.